I like to Blog it Blog it: Silence! The hardest thing for me to do in life is be silent. I am not the best listener and I always have too much to say. So trying Vipassana is a plan I had to throw out of the window. People say it helps with self growth so I always thought maybe I should give it a try. Plus it may help if I ever get stranded on an island like Tom Hanks in Cast Away without a Wilson. I just think it's not for me. But, I've always wondered what some silence in my life would be like. And last week, I experienced it twice. I went for the screening of an old French film. All the French I know is from about 3 French songs and about 10 more words. But, it didn't matter since this was a silent film. I walked in about 10 minutes late which sort of added to the confusion. The film was called Three Ages. It was a comedy film about a man trying hard to win over the heart of a woman which is shown over 3 ages - the stone age, ancient Rome and the 20's which ended up looking like a mash up of the Flintstones, Ben Hur and the Artist. What made it interesting was that a French jazz band called Ozma was playing the background score for the film. Live! It was a bit strange but good strange. It ended with the good guy finally winning the heart of the woman. Love. Good winning over evil. Music. Everyone went home pleased with themselves and with life in general. Movies like this make me believe in happy endings. I went to a silent disco. It was out of sheer curiosity. I was more than excited to experience this but unfortunately it turned out to be a little disappointing. Now you may wonder what kind of a nutjob goes for a silent disco. And what is a silent disco? Well, a silent disco is one where the DJ streams the music straight to your wireless headphones. 1. So there can be more than 1 DJ at a time and you can choose which one you want to tune into so everyone is dancing to different music at the same time. 2. To look like a complete moron to those who don't have headphones on. To me all these reasons sounded good enough to go and give it a try. I thought this could only be fun or funny so what have I got to lose? The silent disco that I went to was in an open ground so anyone could walk in and enjoy it. It was at an Indo-German event in the city. They had covered the ground with beautiful mini pavilions for their different events and you just didn't feel like you were in the middle of Bombay. - there was only one dj - Ada who took a while to start playing the fun music. - and the reception on the headphones wasn't perfect so I'd keep reseting it and had moments where I was listening to cricket match commentary, Gotye, Coldplay and Munni badnaam hui on the radio. 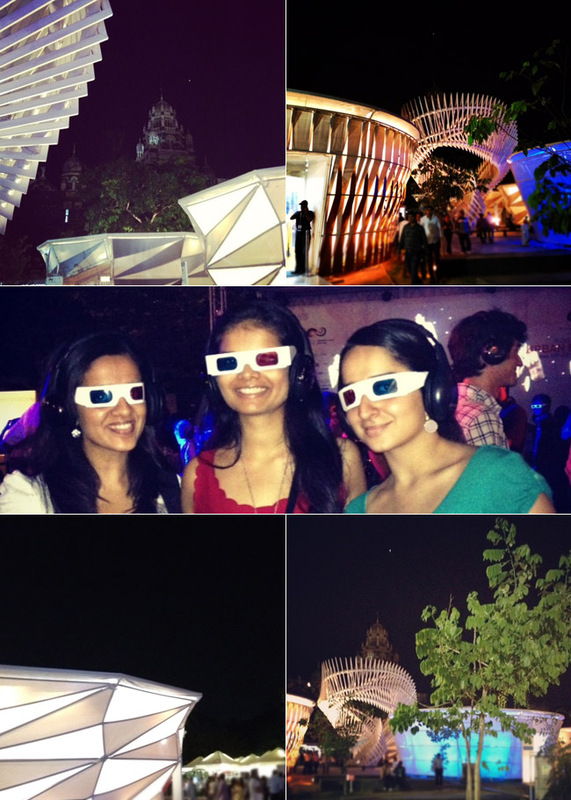 We even got 3d glasses to enjoy the visuals created by B.L.O.T. Just to make sure we looked as ridiculous as possible if we didn't already look funny enough dancing with headphones on. For some reason I felt like one of those people who were trying to contact aliens by using various devices.